China’s Belt and Road Initiative will result in important strategic consequence for the countries of South Asia, writes David Brewster. But its impact on China itself should not be ignored. In geopolitical terms, South Asia has long functioned like an island, nominally attached to Eurasia but not really part of it. Overland pathways between South Asia and Eurasia are scarce and tenuous. Mountain ranges, deserts, and jungles across the southern fringe of the Eurasian continent cuts off the hinterland from easy access to the Indian Ocean. This geographic disconnect has also long limited China’s role and influence in South Asia and the Indian Ocean. China may be close to the Indian Ocean, but it has never been part of the Indian Ocean region. Historically, South Asia and China have operated in very different strategic spheres. But China’s Belt and Road Initiative (BRI), also known as “One Belt, One Road,” has the potential to fundamentally change this strategic calculus. The BRI includes the construction of new overland pathways to South Asia and maritime pathways across the Indian Ocean, connecting China with the Indian Ocean region. It entails the re-branding of existing projects and new initiatives within the umbrella of a single coherent plan, with a total projected cost of perhaps US $4 trillion. However, despite considerable rhetoric surrounding the BRI, Chinese thinking about the initiative still remains aspirational and evolving. The BRI is primarily driven by economic factors, most immediately China’s need to access new markets for building infrastructure. Overall, the improved regional connectivity provided by the BRI would benefit the entire Chinese economy, including by developing new export markets. Improved connectivity could also drive development in China’s poorer landlocked provinces. The BRI also involves building new production chains that link back to China. In time, this may be analogous to Japan’s “Flying Geese” model of the 1970s, under which elements of the Japanese production chain were moved to Southeast Asia as the Japanese economy matured. Under that model, poorer countries produced the least sophisticated components for Japanese-branded goods, more developed countries would produce higher value-added components, with Japanese companies controlling the system. Like Japan in the 1970s, China is now facing rising production costs at home and in Southeast Asia, making some South Asian countries increasingly attractive for lower value-added production. The BRI includes the construction of new overland pathways to South Asia and maritime pathways across the Indian Ocean, connecting China with the Indian Ocean region. The BRI in South Asia has three main parts: new connections between China’s Yunnan province and the Indian Ocean through Myanmar; the China-Pakistan Economic Corridor (CPEC) that links Xinjiang province with the Indian Ocean; and the oceanic Maritime Silk Road linking the Indian Ocean with China’s Pacific coast. The BRI corridors through Myanmar involve new connections to the Indian Ocean, as well as proposals for an Economic Corridor linking Yunnan with India. However, progress on many projects has been slowed by Myanmar’s move towards democratization and its partial move away from China’s strategic orbit. The CPEC has now become China’s primary focus in South Asia. This would involve new road/rail links, pipelines, manufacturing facilities, and power stations in a series of corridors between Xinjiang province and Gwadar, with a reported cost of some US $40-60 billion. The CPEC would have several different routes through Pakistan that would all join into a single route in northern Pakistan to connect with the Chinese border. The Maritime Silk Route involves the construction of maritime-related infrastructure in Southeast Asia and across the Indian Ocean, including ports, logistical stations, storage facilities, and free trade zones – all controlled by China. It is proposed that China would coordinate customs, quality supervision, e-commerce and other agencies to facilitate the scheme. For some years, Chinese companies have been involved in the construction, expansion, or operation of numerous commercial port facilities in the northern Indian Ocean, as part of a Chinese vertical integration strategy for shipping and ports all over the world. Several port developments in the Indian Ocean are controversial. One is a new port at Hambantota in Sri Lanka, close to the trans-Indian Ocean sea lanes. Another is the expansion of Colombo port – a major transhipment hub that carries some 13 percent of India’s container traffic, which could potentially double if it operated at full capacity. A further port project is at Gwadar in Pakistan, about 600 km east of the Strait of Hormuz where China has built a new deep-water port and airport as the maritime gateway for the CPEC project. Although BRI is primarily an economic initiative, it will have significant strategic implications for China and its role in the region. Although likely enhancing China’s economic and political influence, the picture will be complex – and may not always be to China’s advantage. For one thing, these new pathways will give Beijing a much greater direct stake in the internal security of its Indian Ocean neighbours. Beijing’s historically warm relations with countries such as Pakistan and Myanmar, which face significant domestic security problems, has arisen partly because of its ‘virtual’ geographic remoteness. Longstanding policies of non-intervention may become more difficult to sustain as it builds these new overland corridors. China has often preferred to deal with authoritarian regimes which can often be more efficient and provide greater certainty than fractious democracies. But this can also make China’s relationships relatively fragile – as demonstrated in 2015 following the defeat of the Rajapaksa government in Sri Lanka and the election of a partially democratic government in Myanmar, both of which led to a reduction in Chinese influence. China’s ever-growing reliance on the Pakistan Army also carries risks of a backlash in Pakistan, with Beijing being perceived as too closely aligned with the military. Longstanding policies of non-intervention may become more difficult to sustain as it builds these new overland corridors. In addition, economic development may not always deliver the security benefits assumed by Beijing. China argues that state-driven economic development would “[wean] the populace from fundamentalism.” But the historical experience of other developing countries in imposing ‘top down’ development as a means of addressing major security challenges has not necessarily always been positive. Beijing has previously deployed security forces in Pakistan‐occupied Kashmir to protect Chinese workers on the Karakoram highway, and it could soon find itself called upon to secure a corridor extending across much of the length of Pakistan. Although Pakistan has established a 12,000-strong special security force to protect Chinese workers, it is certainly conceivable that Chinese security forces could become engaged in domestic conflicts in Pakistan. We may soon see the deployment of Chinese marines to the port city of Gwadar to protect Chinese nationals and investments. China could also potentially find itself more closely involved in Myanmar’s long-running civil conflicts if Chinese infrastructure was threatened. Importantly, the new overland connections between China and its southern neighbours will operate in two directions – they will not only improve China’s access to its neighbours but also potentially open up China’s landlocked provinces to new influences and even threats. The building of the Karakoram Highway to Pakistan in the 1970s facilitated the creation of new networks between Pakistani and Uighur traders and new communities of Chinese-origin Uighurs in Pakistan and the Gulf. Despite attempts by Beijing to manage their security implications, such linkages are now feeding back into separatist unrest in Xinjiang. In remains to be seen whether Beijing will be able to keep control over the people and ideas flowing through these pathways. China will now be forced to grapple with the numerous problems that arise from much more direct and sustained physical connections with its neighbours – from illegal population movements and smuggling to protecting vulnerable Chinese owned infrastructure and its citizens. Importantly, a growing number of stakeholders in Beijing will have strong interests in extending security to neighbouring Indian Ocean states, if and when security incidents occur. China’s relationship with some of its neighbours could become increasingly securitized. Chinese investment in infrastructure and manufacturing has the potential to drive economic development in South Asia. Many in Islamabad see the CPEC as a “game changer” for Pakistan. Bangladesh sees Chinese investment as potentially economically transformative, while Sri Lanka welcomes it. But these projects can also be the source of real economic concerns, not least undeveloped local markets being swamped with cheap Chinese manufactures. A lack of transparency or consultation and perceived lack of benefits to local communities, including the use of imported Chinese workers, has led to public backlashes against projects in Myanmar (the Myitsone dam project) and Sri Lanka (Colombo Port project). The economics of many projects are also in some doubt, sometimes resulting in ‘white elephant’ projects with high interest loans. International agencies declined to participate in several projects promoted by Sri Lanka’s Rajapaksa government, including the Hambantota port and airport (the latter called ‘the world’s emptiest airport’), which have become significant contributors to Sri Lanka’s debt crisis . The International Monetary Fund has also warned that Pakistan could also face problems from servicing Chinese debts. There is growing talk of China creating ‘debt traps’ across the region. Sri Lanka’s recent decision to hand over control of Hambantota port to China in return for debt relief may only be the first of several such deals. There is growing talk of China creating ‘debt traps’ across the region. New Delhi is undoubtedly the most suspicious of the BRI. For decades, it has kept Nepal and Bhutan as buffer states to limit physical contact with China and has followed a deliberate policy of avoiding road infrastructure in its Himalayan territories. Indian security officials see new infrastructure on the Chinese side of the border as strengthening the PLA’s ability to invade India, and for similar reasons look suspiciously at proposals to build new overland connections from China to Myanmar. The BRI is seen to change the existing regional balance in two ways. First, Indian analysts have long been concerned about Chinese port projects, which many saw as a part of a Chinese “String of Pearls” across the Indian Ocean that could be made available to the PLA Navy to threaten India’s sea lines of communication. The BRI’s maritime infrastructure projects are seen as facilitating the growing Chinese naval presence in the region and potentially threatening India’s aspirations to be the leading power in the Indian Ocean. Second, New Delhi is now looking with increasing alarm at Chinese plans to build connections to the Indian Ocean through Pakistan. The CPEC has only magnified fears that China is consolidating Pakistan’s hold on Pakistan Occupied Kashmir; that China will economically build up Pakistan to become a greater threat to India; and the potential for a direct Chinese military presence in Pakistan. As a result, Indian government is now looking for levers to disrupt the CPEC (or at least threaten to do so), including in Balochistan and other frontier provinces. India’s decision to boycott China’s 2017 BRI Summit is a statement that India does not want to be seen as playing to Beijing’s regional tune. For hundreds of years, South Asia has functioned as a virtual island, with India politically, economically and strategically dominating the region. But China’s BRI initiative is challenging the geostrategic environment. The new overland routes to the Indian Ocean and new maritime way stations across the Indian Ocean promise to fundamentally alter China’s role in the region, and will likely continue to generate reactions, especially from an increasingly wary India. Yet it is also a two-way street – the BRI may also have fundamental, and perhaps unforeseen, impact on China itself. 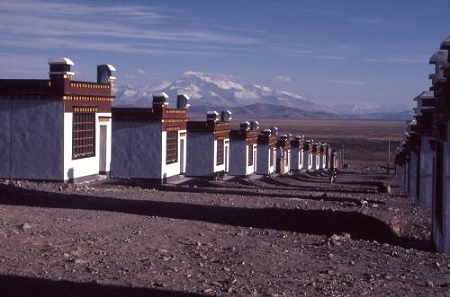 Photo: Forced resettlement site housing Tibetan nomad families at Derchen, Ngari Prefecture, western Tibet. Source: Rudranarasimham Rebbapragada.